^ a b c d Weeks, Jennifer (2015). "Turf Wars". Distillations Magazine. 1 (3): 34–37. Retrieved 22 March 2018. ^ "Chicago Tribune - Historical Newspapers". Archives.chicagotribune.com. Retrieved 1 August 2018. ^ "Blue Jays adding dirt infield at Rogers Centre". MLB.com. Retrieved 1 August 2018. ^ "Pats sign Testaverde; Gillette Stadium's grass field replaced with Field Turf". 14 November 2006. Retrieved 1 August 2018. ^ "BMO Field: New renovations accommodate TFC, Argos - CBC Sports". Cbc.ca. Retrieved 1 August 2018. ^ Lawton, Graham (4 June 2005). "Field battle over artificial grass". New Scientist (2502): 35. Retrieved 11 January 2008. 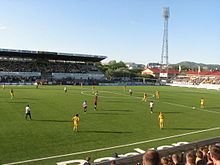 ^ "England to play on synthetic turf". BBC News. 11 July 2007. Retrieved 11 January 2008. ^ "Field 'No Excuse' For England". Sporting Life UK. Retrieved 11 January 2008. ^ "Desso GrassMaster hybrid grass > reinforced natural grass | Desso Sports Systems". Dessosports.com. Retrieved 24 December 2015. ^ "FIFA Quality Concept – Handbook of Test Methods for Football Turf" (PDF). FIFA. Retrieved 20 July 2017. ^ "Chivas quitará el pasto sintético que costó 1 mdd - construccion". Obrasweb.mx. Retrieved 1 August 2018. ^ "El Estadio Omnilife, listo con pasto natural". Mediotiempo.com. Retrieved 1 August 2018. ^ "Artificial 3G Pitches: Coming to a ground near you?". Football Ground Guide. Retrieved 30 October 2016. ^ "The Giraffe, the Pelly & Emily". Gandermonium. Retrieved 30 October 2016. ^ Dominic Bossi (10 June 2015). "Matildas stay out of turf war at women's World Cup". Smh.com.au. Retrieved 24 December 2015. ^ "FIFA: The World Cup Should Be Played on Natural Grass". Coworker.org. Retrieved 9 October 2014. ^ "Equalizer Soccer – Players officially file lawsuit against FIFA, CSA over artificial turf at 2015 Women's World Cup". Womens.soccerly.com. Retrieved 9 October 2014. ^ a b c d "ITF surface descriptions". Itftennis.com. Retrieved 1 August 2018. ^ "Tennis". Dow.com. 3 August 2001. Retrieved 24 December 2015. ^ "Wimbledon considering controversial plans to introduce artificial grass courts". Tennis365. Retrieved 31 July 2018. ^ Hall, Janet (11 March 2018). 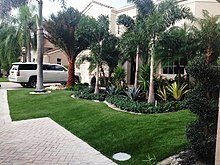 "Pros and Cons: Artificial Grass Versus a Live Lawn". Retrieved 30 April 2018. ^ "Airside Applications for Artificial Turf" (PDF). Federal Aviation Administration. 2006. ^ Monte Burke (27 November 2006). "Field of Screens". Forbes. Retrieved 11 January 2008. ^ Kole, Pieter Jan; Löhr, Ansje J.; Van Belleghem, Frank; Ragas, Ad; Kole, Pieter Jan; Löhr, Ansje J.; Van Belleghem, Frank G. A. J.; Ragas, Ad M. J. (20 October 2017). "Wear and Tear of Tyres: A Stealthy Source of Microplastics in the Environment". International Journal of Environmental Research and Public Health. 14 (10): 1265. doi:10.3390/ijerph14101265. ^ "Tire wear foremost source of microplastics". IVL Swedish Environmental Research Institute. 29 March 2016. researchers have ranked the sources of microplastic particles by size. The amount of microplastic particles emitted by traffic is estimated to 13 500 tonnes per year. Artificial turf ranks as the second largest source of emissions and is responsible for approximately 2300-3900 tonnes per year. ^ "Microplastic Pollution from Artificial Grass – A Field Guide". KIMO. 27 February 2017. 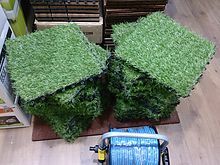 ^ "Artificial Turf. Why it is not the answer". SELVA. ^ "Microplastics in agricultural soils: A reason to worry?". Norwegian Institute for Water Research (NIVA). 3 February 2017. Microplastics are increasingly seen as an environmental problem of global proportions. While the focus to date has been on microplastics in the ocean and their effects on marine life, microplastics in soils have largely been overlooked. Researchers are concerned about the lack of knowledge regarding potential consequences of microplastics in agricultural landscapes from application of sewage sludge. ^ a b "New Penn State Study Debunks Staph Bacteria Scare In Synthetic Turf" (Press release). Penn State College of Agricultural Sciences. 30 August 2006. Retrieved 11 January 2008. ^ C. Frank Williams, Gilbert E. Pulley (2002). "Synthetic Surface Heat Studies" (PDF). Brigham Young University. Retrieved 19 February 2008. ^ "Ask Dr. Geier – Are ACL tears more common on grass or FieldTurf? | Dr. David Geier – Sports Medicine Simplified". Dr. David Geier. 18 January 2013. Retrieved 24 December 2015. ^ "Turf Toe-OrthoInfo – AAOS". Orthoinfo.aaos.org. 1 August 2012. Retrieved 24 December 2015. ^ David R. Brown, Sc.D. (2007). "Artificial Turf" (PDF). Environment & Human Health, Inc.